← Be Nice to People Celebration! This would be why I try to take my camera with me everywhere I go…..rare ~ sweet moments. Have a great one, friends! 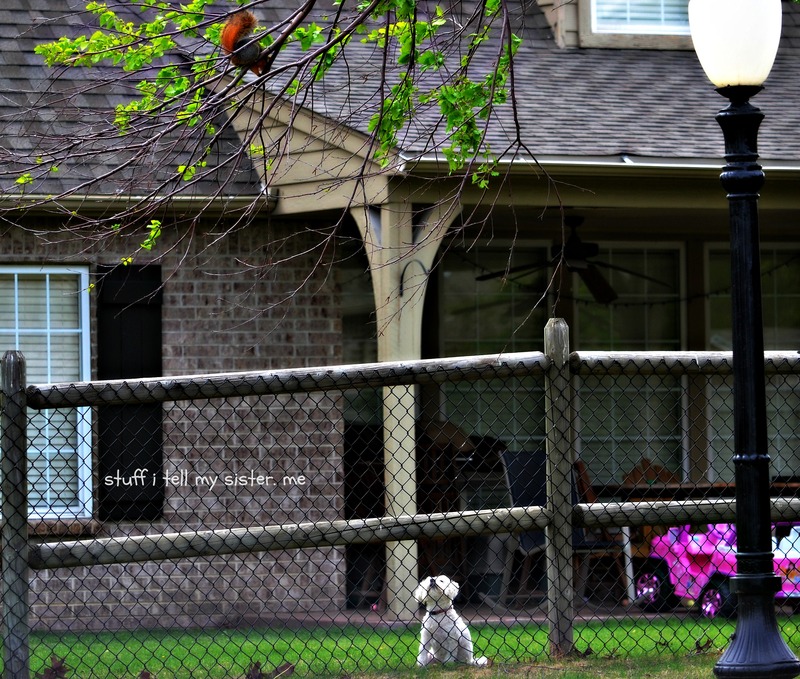 This entry was posted in Curiosity, Dogs, Intrigued, Oklahoma, spring, Uncategorized and tagged animals, dog and squirrel, hanging out, random shots, Squirrel, you don't see me. Bookmark the permalink. My sister-in-law has a dog just like this one. Very cute! Yeah.. That’s a great shot! Hope your folks are ok after the bad weather last night. Beautiful photo, too. They were in the all clear….you guys ok? Too much rain on still wet ground and very brief hail, but all is quiet tonight. Sure is a sweet sound. Storms can be wicked….but when it’s rain and at night….nothing better. Could sure use some more rain around here! 🙂 a Kodak moment for sure. Thanks Bulldog….hope you are feeling better. It is a pain sometimes…for sure! So lovely … great captured moment, priceless … wonder what is going on in that little head there and then. I love this. Right place. Right time for sure! 🙂 Wanted to take them both home with me.